My spiritual journey at the moment is working on trusting my intuition, listening to what is being said around me, including my dreams, and being grateful for everything. I have been cleaning, cleaning, cleaning in preparation for 2 weeks of fabulous company that starts arriving tomorrow morning. All the time being grateful for my furniture that I can dust, my floors that I can vacuum, and trying to be thankful for the toilets I can scrub. So far my spiritual plan is working like a charm. My youngest daughter is going to start selling Gator Girl Art prints and cards on Etsy. It seems like a win-win situation. With Etsy I will be able to sell at a bargain price and Katy will handle the mailing and correspondence so I can paint. While I was listening, I heard “Etsy” from three different sources in one week. I am beyond excited about this. If you want to check out another blog, I have been reading knowthesphere.wordpress.com. Jeremiah is insightful and pairs his insights with stories. He is a freelance writer living in upstate New York. Sometimes a kind gesture seems to go unnoticed, but makes a positive ripple in someone’s life. Today, I celebrate two fabulous women who do kind things every day. They both happen to be my aunts. I think aunts and grandmas are like moms only without the baggage. Unless they raised the child, they are free to just spread love. My Aunt Ruth is in her 90’s. She is the older sister to my mother. 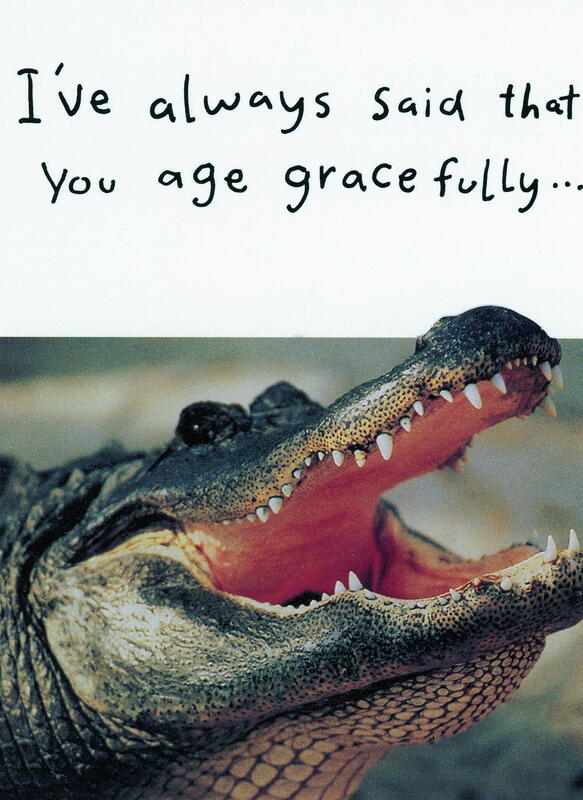 She took the time to send me a card that someone had given her with an alligator on the front. That simple gesture validated me as an artist. It was double nice because Ruth is an amazing photographer and artist. 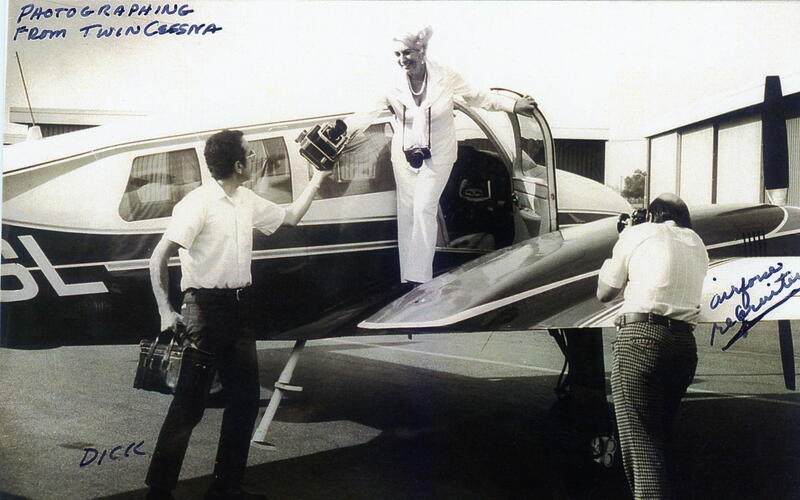 This is Ruth when she was a photographer in Arizona. Another Aunt, Grace, lives an hour away. 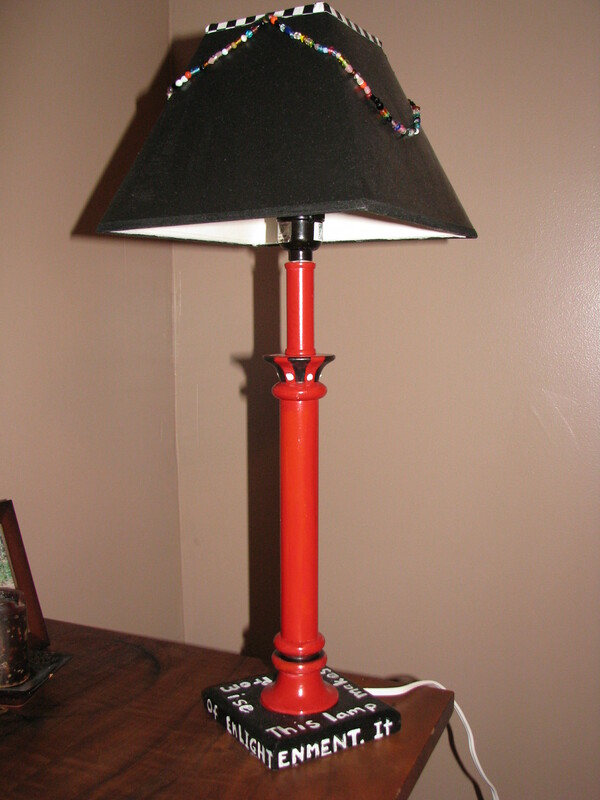 She came to my Gator Girl Launch Party and gave me a lamp that she bought at a garage sale. She thought it would be fun to paint. And it was. I painted the shade with acrylic Mars Black. I love that black. I strung some glass Mardi Gras Beads on the shade. I love the beads, but maybe not on the shade. I painted the words on the base, then went around them with a black paint pen to make the letters crisp. I gave it to my husband for his bed side table. I thought the red would be good Feng Shui. 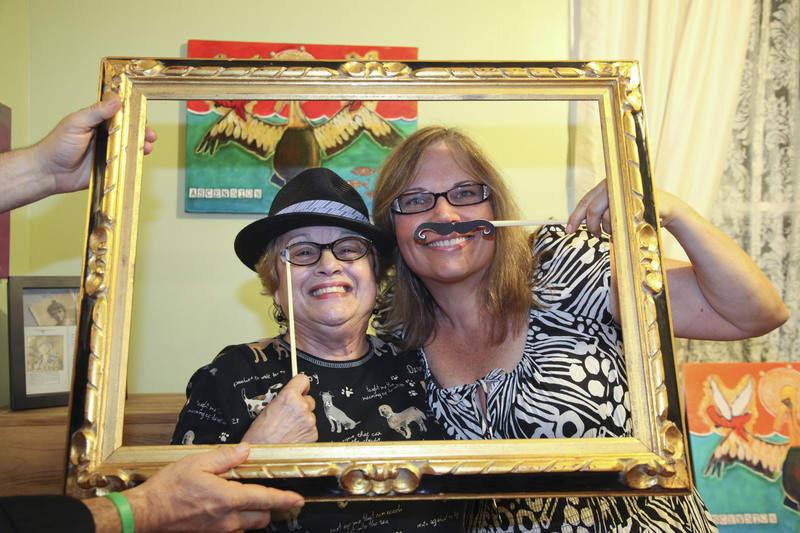 Aunt Grace and me at Gator Girl Art Launch Party. Isn't she cute! Grace has 5 adult grandchildren and she still took the time for me. I have painted and re-painted. From experience, I think the paintings that take a while end up being closer to my heart. I am starting to like this one. The music is “Mardi Gras Mambo”. There are small words about Mardi Gras woven through her hair. 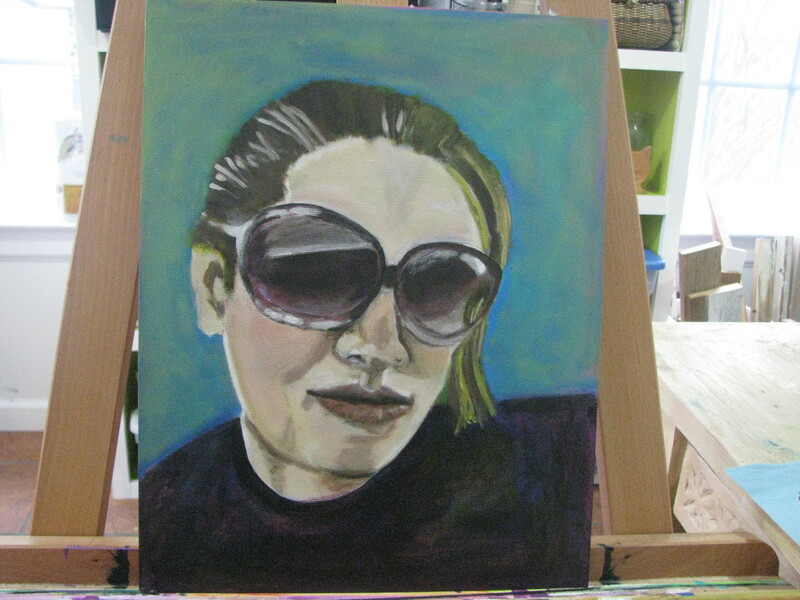 I started painting people from photographs for fun. I like them a little edgy, not like their photos exactly. 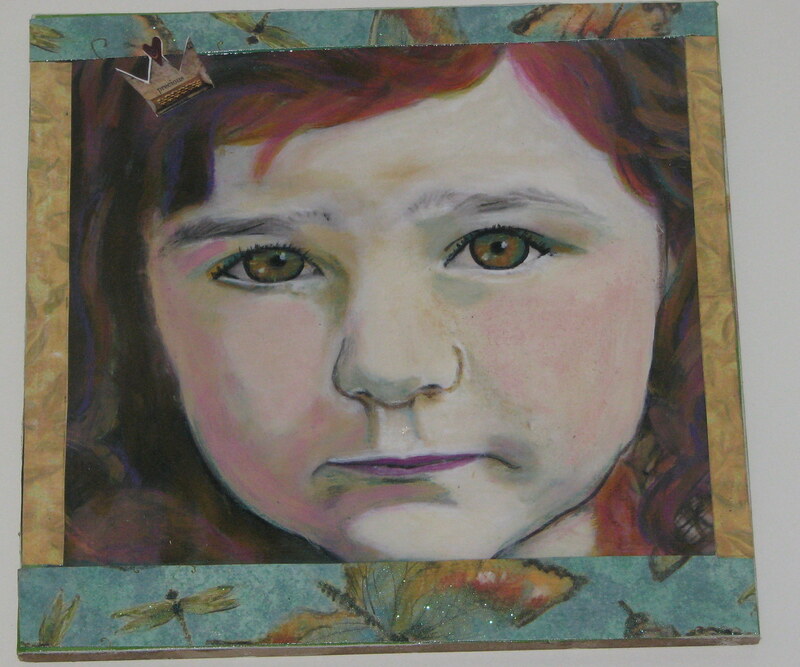 I bordered this painting with dragonflies, because Maggie is in the dragonfly class this year. And a little crown for my princess. Raffi looks so different now that he is 2. Such a little baby face here. Katy in progress, maybe done. This is Katy’s Facebook picture. My husband, David, doesn’t like it because she has sunglasses on. I think she would appreciate being incognito. 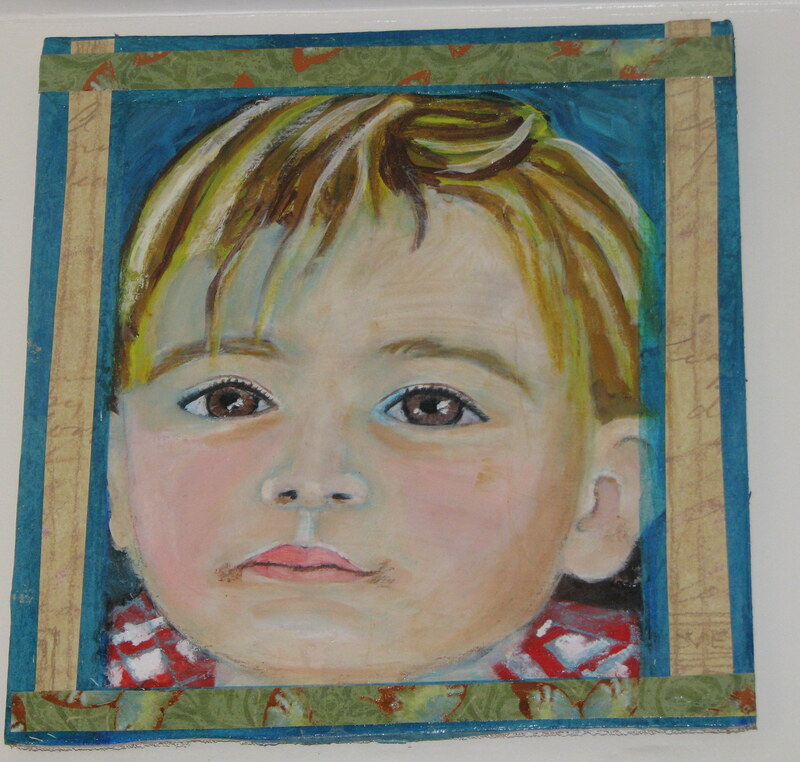 All of the people paintings are about 10 x 10 inches. I was totally long-winded today. Thank you for letting me share. Just wondering today if you know that you can paint your future? A few years ago, my mentor, Rev. Shiloh McCloud, needed two people to help her run her women and girls publishing company. She started painting three women, just standing together, smiling. Shortly thereafter, at the exactly right time, the perfect women showed up. One of the women, Mary, just wandered into Shiloh’s gallery and fell in love. She was visiting from Canada at the time. She packed her bags and moved straight away — been here every since. Three years ago, when I was living in California, I started painting alligators, angels, and swamps. 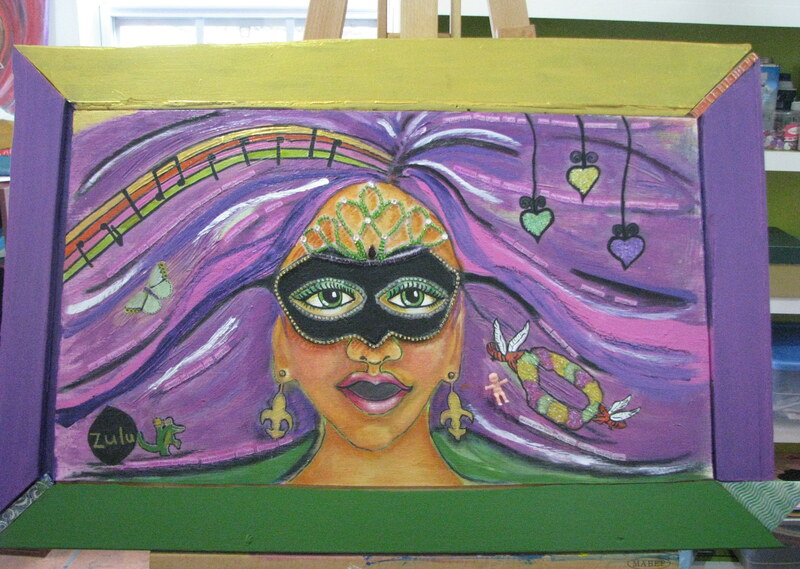 I was consciously painting my way to New Orleans. Everything unfolded perfectly, down to the last detail. I told anyone who cared to listen that I was retiring in three years, moving to New Orleans and becoming a full-time professional artist. Speech is undeniably powerful. Just as I believe all religions are roadways to the same higher power, I believe any means you use to project out to the universe what your dream is will work. Do you write? collage? 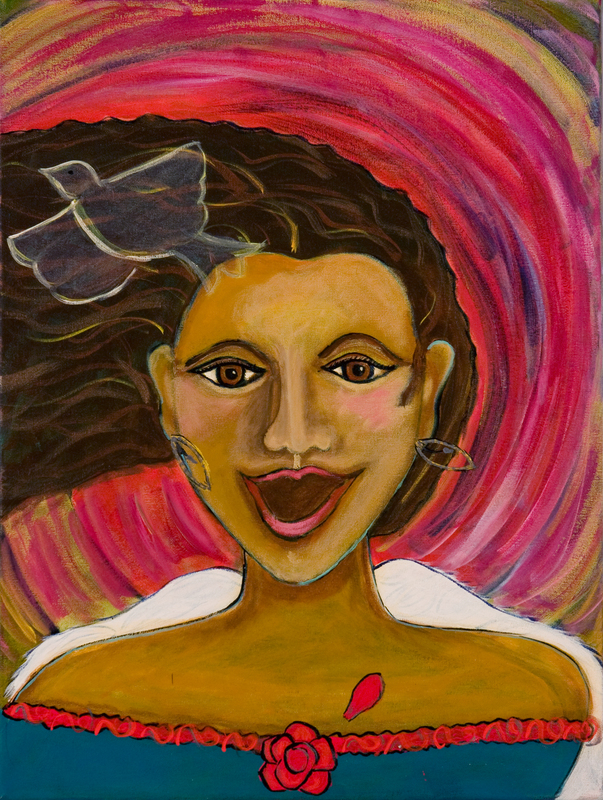 paint…sing…dance…sculpt… How do YOU put yourself into your perfect life? I am holding off sharing Mardi Gras Muse with y’all because I just bought a miter saw, installed it in my kitchen, and am making a frame before I post her next week. My idea is to make a frame out of reclaimed wood and embellish it with whatever calls to me. I put fine silver glitter on her veil to make it stand out more. I put red chunky glitter on her roses and gold metal finish on her gold tooth. She makes me very happy now. 2 coats of varnish insure her lasting beauty. 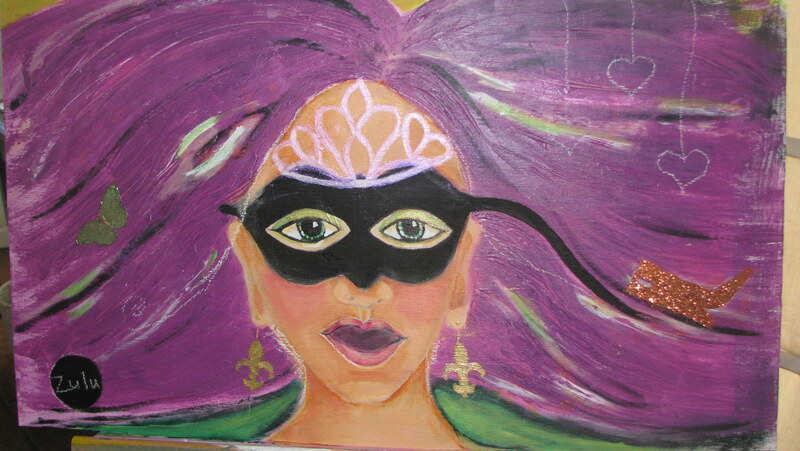 Mardi Gras Muse or as Maggie insists Maskatier Princess (named for her mask and partial tiara), is still in process. I played with both kids all day Friday and Saturday and it threw off my painting time in a good way. I am having a lot of fun painting the muse. She is wild and entertaining. Her hair is a mixture of purple and pink paint in Golden Heavy Gel. I like the ridges. It gives her hair a thickness that mine has never achieved. 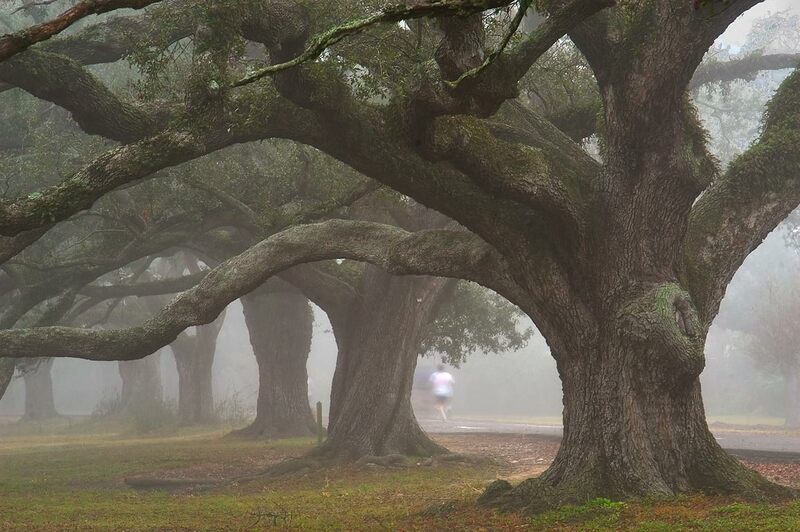 It seems like Spring has arrived in New Orleans, at least for today. It is a little chilly, but the sun is shining. We are having a crawfish boil in Audubon Park by the Mississippi River later today. I don’t think life gets much better.